A scholar of systems theory and a long-time Buddhist practitioner, in the 1970s Macy began developing “The Work That Reconnects,” experiential workshops that help people contribute to the development of a life-sustaining society. Macy offers Work That Reconnects workshops around the world and has written several books, her most recent being Coming Back to Life: Practices to Reconnect our Lives, Our World. The Work That Reconnects leads people through what Joanna calls “The Spiral”—a process that begins with “gratitude,” moves to “grief for the world,” then to “seeing with new eyes,” and finally to “going forth.” Macy calls this “The Great Turning”—a necessary, revolutionary transformation from the present-day industrial growth society to a future life-sustaining society. Gratitude is a revolutionary act because it counters the thrust of the industrial growth society, or the consumer society, which breeds dissatisfaction. You have to make people dissatisfied with what they have and who they are in order that they keep buying. We’re consuming, we’re making money out of extracting goods from the earth that cannot be renewed. We’re driven by the economy to make money by engaging in processes that create huge amounts of waste—whether it goes into the seas, the atmosphere or the soil—that will contaminate the living biosystems for centuries to come. For life to continue, we must invent a whole new way of supporting human life on earth. That change is coming. It’s not visible to many people because it is not being reported by mainstream media—written press or electronic. But it’s happening and that’s what I see as the third revolution. What’s happening is breaking through at the grassroots level—in peoples’ minds and behaviors. This is the big adventure, the third revolution that some of us call The Great Turning: the transition from the industrial growth society to a life-sustaining society. To be alive at this time, with all this uncertainty, even when we’re not sure we can make it, is our immense good fortune. 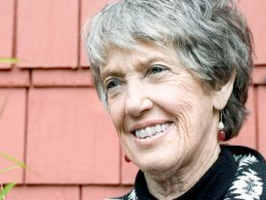 Joanna Macy turns despair into social activism.